Sowing seeds of compassion and love, Multidimensional Artist and Human Being, Elizabeth Bast, has dove heart first into her enigmatic inner landscape to integrate grains of her raw truth that have taken root. Through moments of sacred communion with both her transcendental magic and the darkness of the night, Elizabeth is rooted in the richness of her life experience which had led her to embed her time and energy into awakening healing gifts for all to receive. 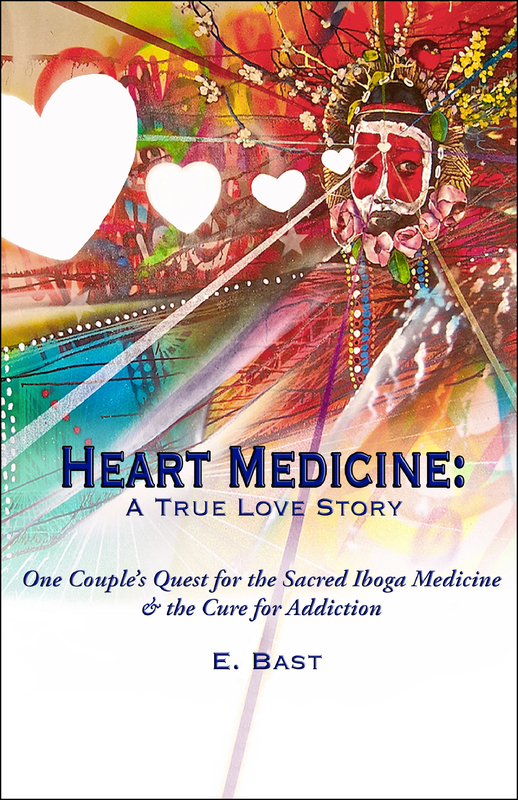 I had the pleasure of diving into Elizabeth’s idiosyncratic spirit to shed light on the discovery of her life’s purpose, raising awareness of the healing benefits of Iboga, being rooted in the present, ‘Heart Medicine: A True Love Story’ and more. JG: As you are experienced within a variety of artistic mediums, was there a specific inner moment that you recall throughout your journey that hinted toward a bigger picture of your life’s purpose? When did you first feel the healing energy within yourself? EB: I discovered my life’s purpose in layers. I started to practice sacred dance, yoga, and journal writing at the age of 15, which later carried me to my teachers of tantra and healing arts for many years, which eventually carried me to plant medicine ceremony. I recall a moment in my first ayahuasca ceremony, when I was utilizing my breath, movement, self reflection, and ability to value the discomfort, and I suddenly became supremely aware of and grateful for every single moment of yoga, breathwork, dance, and meditation practice I’d ever had in my life. I felt like I’d been being “honed” for two decades. Though that may not always necessary for entrance into plant medicine ceremony, that is what helped me to navigate and receive the full benefit of the medicine. At that moment, there was a commingling and a crossroads happening that was important for me. I didn’t see quite how it would come to fruition at the time, but I knew I would be dedicated to sacred plant medicine ceremony, and I would somehow use all my skills for that. Years later, I met the iboga medicine, now my primary plant ally, and the Bwiti, the tradition that I am training with. And when I met ibog, I was supremely aware of and grateful for every sacred medicine I’d met before that big plant spirit! JG: Your book, ‘Heart Medicine: A True Love Story’, is compelling and therapeutic for the reader, yet have you found that writing the book has benefited to expanding your overall perception of how your experience with iboga has shifted your life experience? EB: Absolutely. The book began as an inspired act of service for people and for the medicine. To this day, that was the most powerful earth-magic and dramatic healing experience that I’ve ever encountered. When I reentered the world after our first ceremonies, I was shocked at how many people had never even heard of iboga and ibogaine—or their potential healing properties, and the people who had heard about them often had dangerous assumptions. I wanted the book to serve as an artistic vehicle to raise awareness about the medicine. As I went through the process of writing the book, I discovered that writing the story was a great form of personal integration, and it helped me to turn our experience “into diamonds” in my memory. To this day, I will open a page of it, and be reminded of the precious lessons that came through our journey. More, the act of writing helped me to let go of the past and move forward, unburdened. JG: If you can metaphorically affiliate your experience with the plant medicine, iboga, to the characteristics of an animal, which animal would you choose and why? EB: This might seem like a funny answer, but I would say the Porcupine! In the Bwiti oral tradition, it is the porcupine that was said to have brought the medicine to the human beings when the creature consumed iboga before being eaten by a hunter’s wife. The porcupine is tough, sturdy, grounded, and humble looking; just like iboga. JG: What significant inner experiences or feelings did you subconsciously float through and heal through the connection you have made with iboga? EB: This is a big answer. The iboga medicine gave us much more than we bargained for. It ripped the whole rug out from under our previous life, in the best way, and gave us a new one. But that was no passive transformation, we had to step up and meet the medicine halfway, every step of the way. When I was first researching options for Chor’s opiate relapse, I learned that iboga could also be helpful for PTSD in addition to addiction, so I initially came to the medicine for that purpose. My PTSD had endured despite many years of other modalities and therapy. Iboga definitely helped me with that, through visionary teachings and a deep mind-body-spirit detox. Iboga also helped me to clarify my soul’s truth in all realms of life: intimacy and relationships, current professional purpose(s), and behavioral patterns. I realized that many of my choices were previously motivated by fear instead of love. It was not always easy to face the stark truth, but I am grateful for it now. Iboga also helped me to move past a negative, “autopilot” type of thinking—into intentional thinking and greater self-awareness. JG: Let’s dabble into your current endeavors. What projects or particular artistic medium have you been embedding your focus and time into? EB: Currently, Chor and I are devoting a lot of time to raising awareness for the medicine and the Bwiti through speaking opportunities, writing/journalism, and his artwork. I essentially became his manager at a point, so I am even more devoted to seeing his art recognized. His art is truly visual medicine in my eyes; it has been incredible to see how the medicine continues to flow through his work. We are currently in training with the Bwiti tradition to someday serve as iboga providers. Let’s just say it’s not a linear process or university curriculum. It’s very organic. Spirit-willing, we will be able to offer ceremony someday, in countries where the medicine is respected and legal. I sense there is another book gestating in me: Africa. Stay tuned! I am also currently in the midst of completing the addiction recovery & psychospiritual (entheogenic medicine) integration coach training program with Being True to You. It’s a profound and cutting-edge program. I am excited to support people in their process of preparing for and integrating recovery work and sacred medicine ceremony. And….I plan to offer more dance and performance art in the coming year, with any spare minutes! JG: If you could sit down and have a conversation with either yourself as a burgeoning child or a wizened senior citizen, who would you choose and why? EB: The child, because of her raw spirit, innocence, and creativity. In young children, our essential nature is so clear, present, and (often) untarnished, and this essential nature is pure love and authenticity. Though at a point, the child and the wise old person are almost identical in certain phases! There is a certain playfulness and surrender to the moment that both of those aspects can possess, in their healthy expression. JG: What’s one exercise or activity that you would recommend fellow individuals begin practicing to lead a more positive, happy and fulfilled life? EB: Enjoy you! This is a lost art! People are so distracted and overstimulated by electronics and excessive information. We are enmeshed in a culture that values doing more than being, all while rushing at breakneck speeds. To enjoy you, come into the present moment: STOP, even for just 10 lusciously savored breaths, and pay 110% attention to each one of your senses. Try it. Go ahead. I’ll wait! JG: We are living in a time when knowledge and wisdom is being made available to more and more people through the wonders of the internet. How do you perceive that social media, blogging and the digital world support the growth of awareness in our society? EB: Though people are too often plagued by the click-bait of nasty, fear-pimping news and overly polished, gratuitous “insta” booty pics, the digital world definitely has a light side when we remain highly intentional with our use of it. The spread of authentic and helpful information is very powerful for global transformation, social evolution, awakening, and the spread of more eco-friendly technology. We also have the potential to study our human nature from an eagle eye view, taking into account many different cultures and time periods. We can connect across great distances, even across different languages instantly, and find our common humanity under all the superficial differences. JG: Let’s create a mini soundtrack that is representative of your current state of your mind. Choose three tracks that shed light on your present. EB: Traditional Missoko Bwiti Temple Music. We play that exquisite, polyrhythmic ruckus all the time in our house and during our travels. It’s amazing medicine for the mind & soul. You can find plenty on YouTube, though we record ours live in Africa. JG: What is your perception of a life of happiness? EB: Happiness, for me, has roots in gratitude and presence. I am so grateful to be so grateful. I am a total geek in that way. I have come to imbibe ridiculous amounts of joy from the simplest, most ordinary things: sunshine on my face, walking, eating a fresh apple, seeing a loved one, or just breathing. I know that this has more to do with the direction of my attention rather than the external circumstances that might come and go. I give a lot of credit to the medicine, the traditions, and the practices that I have experienced throughout my life for this increasingly lovely state of affairs. I have come to appreciate that I am the artist of my inner landscape and my frequency. No one can ultimately dictate the state of my mind or heart, besides me. Each moment on earth is MINE to savor fully, no matter what might be going on outside of me. I don’t want to give away those precious moments to old habitual triggers or outside forces. That’s happiness—and it’s an ongoing practice. Enjoy! Previous Post The Reality of Truth Film is Now Available to Watch in 9 Languages!